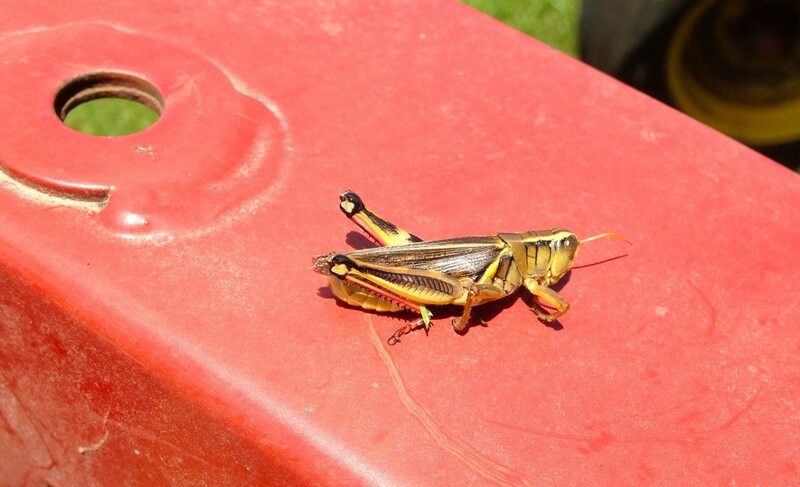 This summer we’ve had a number of grasshopper infestations in the areas of Tuckahoe and Goshen, Cape May County. Commercial growers have called to report swarms of grasshoppers in their nurseries and hay fields. On farm visits, I’ve seen them covering telephone poles, farm equipment, and all kinds of vegetation. This is an unusual and devastating event for the plants they come into contact with since they essentially chew the plants down to the ground before moving on to fresh foliage en masse. New Jersey has several species of grasshoppers with the redlegged grasshopper, Melanoplus germurrubrum being the type identified on this farm visit. Typically during late August to September, grasshopper females deposit eggs in the soil in masses of 20-120 cemented together to form a hard case. A single female may deposit from 8 to 25 egg pods during her lifetime. The egg pods overwinter to hatch the following spring. Management tactics include 1) mechanical control by lightly tilling the soil during infestation – grasshoppers prefer not to lay eggs in disturbed soil and tillage also destroys egg pods; and 2) preventative treatment with the biological control agent Nosema locustae. Nosema locustae is a protozoa that acts to kill young grasshoppers (not adults) soon after emergence in Spring. Nosema locustae baits are perishable and are best refrigerated before use. Grasshoppers and Their Control. Texas A&M University E-209. C. Patrick and S. Davis, 2004.